Turkey tacos are a beautiful thing. You can slow-cook the legs and thighs and coat them in a sauce, like my Yucatecan turkey, or you can brine and sear the breast meat, then chop it, which is this recipe. Turkeys, you may or may not know, were domesticated by the Maya and Aztecs a few thousand years ago. As a result, Mexican cuisine is loaded with recipes for pavo, or, if you are south Mexico, guajolote. This isn’t one of them. Nope, my turkey taco recipe is a hybrid of American and Mexican influence. Traditionally seared turkey breast, but with jack cheese. Mexican roasted poblanos, but nothing unusual beyond that. Avocado, cilantro, maybe some green onions, that’s it. I made my own corn tortillas, but you could use whatever tortilla makes you happy, corn or flour, even hard shells. I won’t judge. I also use a wild turkey here, a Rio Grande I hunted in the nearby Sierra Nevada. You could use any species of wild turkey of course, and there is no reason you can’t use a store-bought one, too. Only thing is you won’t need to brine the store-bought turkey. To brine the wild turkey breast, cut it into three pieces. You’ll notice a turkey breast is shaped like a teardrop, with a thick end and a thin one. Slice off the entire thin end, which will look like a triangle. The remaining breast will be thick. Slice this in half crosswise to make two pieces roughly the thickness of the end piece. Dissolve 1/4 cup of kosher salt in 1 quart of water (I use Diamond Crystal) and submerge the turkey breast. If you need more brine, make more in that ratio. Brine the turkey in the fridge overnight. Remove and pat dry before proceeding with the recipe. An alternative to brining is to marinate your turkey breast. I really like a marinade of tequila and lime. It definitely adds something to the tacos. Keep in mind that this is my rendition of turkey tacos. There is no reason you can’t change the cheese and toppings to suit your own taste. Some other good options would be a simple pico de gallo, some other salsa, such as my salsa negra, shredded cabbage or lettuce, Mexican cheese… you get the point. 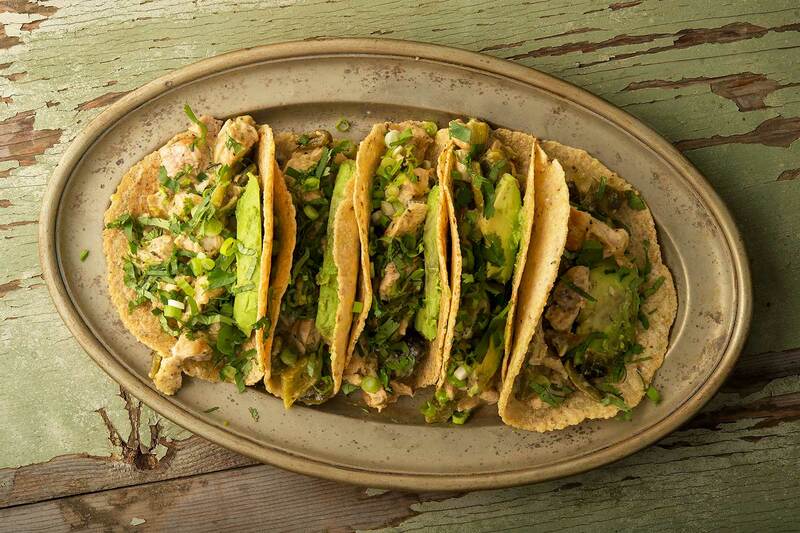 These are turkey breast tacos. 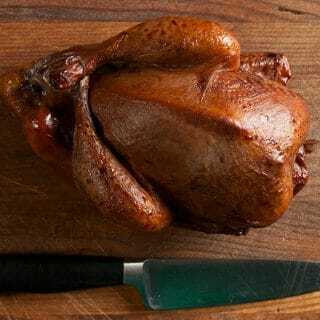 If you want to make tacos with turkey legs, try my recipe for Turkey Yucatan. If you don't know how to roast peppers, here is a tutorial. Cut the turkey breast into four or five pieces of about the same width and salt them well. Mix the tequila and lime juice and submerge the turkey breast in this. I do this in a Ziploc bag. Refrigerate overnight, or at least 1 hour. Roast all your peppers, seed and remove the stems and cut into strips or chop coarsely. This can be done a day or two ahead. If you are doing this ahead, toss the roasted chiles with some lime juice and salt and keep in the fridge. Get a comal or skillet very hot over high heat. Get a tortilla warmer or some kitchen towels ready. Heat the tortillas for a minute or so on each side, until they char just a touch and puff up. Keep them warm in the tortilla warmer or in the towels. When you are ready to make tacos, pat the turkey breast dry. Cut the marinated turkey into about 10 pieces of roughly equal size. Coat with the oil. Sear the turkey pieces on the hot skillet for about 2 minutes per side. You want a nice sear, but without overcooking the meat. Set aside as they are finished. When the turkey is ready, chop it into pieces you want to eat in a taco. Put it back in the skillet with the poblanos and the jack cheese. Toss for a minute or so to melt the cheese and mix well. Serve immediately in the tortillas with the toppings. NOTE: This recipe doesn't include the brining time, if you are brining the turkey breast. You can find all sorts of turkey recipes, as well as recipes for other upland birds, here on Hunter Angler Gardener Cook! Hank, Really like this recipe. Wonder how it be with pheasant? Keep up the great comida! Looks awesome, had hoped do this with the turkey legs from my first gobbler this week, but he had some nasty-looking gangrene in his right thigh and left drumstick – somebody probably took a careless shot at him in a prior season, because it wasn’t something I could’ve caused between shooting and butchering. Should the breast meat still be okay if the infection was just in his legs, or is the whole bird a lost cause? Dan: Yes, the breast meat should be fine if it looks and smells fine. I made this with chicken and it’s awesome! The tequila lime marinade is the key to great flavor. Keep up the good work!